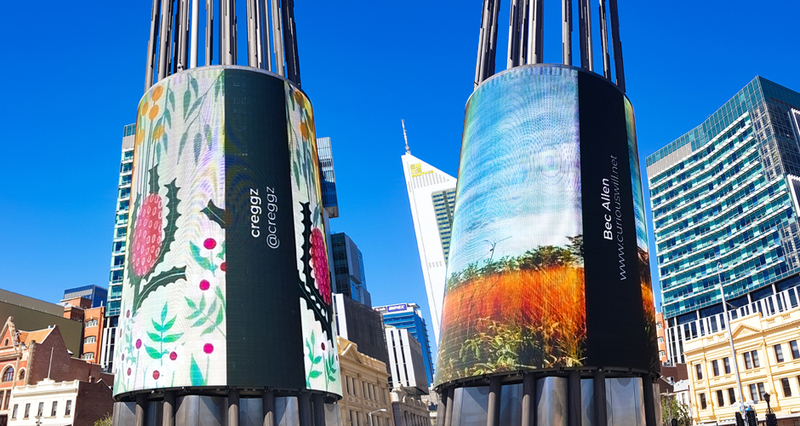 Screenwest is providing artists with the opportunity to display their bespoke artwork on Yagan Square Digital Tower, a unique platform in the heart of Perth City. Artists are invited to submit artwork to digitally exhibit on Yagan Square Digital Tower. The artwork should be designed to complement Yagan Square’s round tower. In return for providing Yagan Square with a 12-month non-exclusive license to display their work on the Digital Tower, artists can promote their website/social media handle to a public audience. Artists can incorporate a banner in the piece, as per the reference image, to promote their name and website or social media handle. Yagan Square Digital Tower credit example. Artwork by creggz and Bec Allen. Graphical content should have clean blacks, clean edges, simple colours and be corrected for the Digital Tower’s cool colour bias. Note: Dark images are not visible during the day in direct sunlight. The Digital Tower is a unique circular screen at the heart of Yagan Square, highlighted on The New York Times’ list of 52 Places To Go In 2019. Find out more on the MRA website.